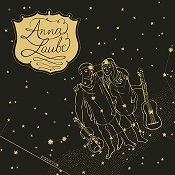 There isn’t any shortage of serious material on this album, Anna Laube’s third, but the one unusual ingredient is a sense of fun, both in the lyrics and the musical arrangements. It’s not about funny songs, far from it, but it sounds like at least some of the songs were written and played with a bit of humour. There are lots of references to albums and musicians and there’s an element of musical homage in there as well; it’s an album that might make you think, it might make you dance, but it will almost certainly make you smile. References to a quest for self-knowledge run through the album, from the opening song “Already There” to the closer “Green”, both played in a California country/rock style with a close-miked vocal creating an intimate feel which permeates the entire album like a warm sunset. The album’s second song, “Chocolate Chip Banana Cup Cake” is a bouncy, jazzy shuffle with a lyrical theme of food as a displacement activity for romance (it’s strange, but there are more food references on this album than drugs and booze references on the average album) and it leads neatly into the even more jaunty nostalgia of “The Bike Song”. As a rule, I find megaphone-style vocals as appealing as scraping a piece of expanded polystyrene down a window, but they work within the context of this love song to a lifetime of cycling with its strange but gleeful references to ‘frozen custard’ and a scar in the shape of ‘Mike Campbell’s double-neck guitar’; it’s bonkers but incredibly engaging. “Oh My (Oh Me! Oh Me, Oh My)” is about an infatuation and it’s set against a backdrop of a bar-room honky-tonk which seems to be constantly on the verge of breaking into Bobby McFerrin’s “Don’t Worry, Be Happy”; again it’s great fun. The slow country feel of “This One’s for You” is perfect for the wistful remembrance of first love, where the emotional authenticity is enhanced by the reference to listening to “Blood on the Tracks” and “Harvest Moon”; it’s intimate and beautiful. “Sugarcane” is a clever and very catchy reworking of “Cocaine Blues” with another white substance replacing the devil’s dandruff. It pulls off the clever trick of making the reworking clever and funny without appearing twee. “Satisfied Mind” is a cover of the Joe ‘Red’ Hayes and Jack Rhodes country classic and it’s a very brave choice because it’s already been covered every which way, by everyone from David Allen Coe to Ella Fitzgerald. Anna’s version (which has a female protagonist) slows the piece right down and relies on a minimal backing with heavily-reverbed guitar to underpin a beautifully controlled and intimate vocal; it’s gorgeous. “Sweet Boy from Minnesota” is another gentle piece which looks back to an earlier relationship with warmth and affection while “You Ain’t Worth my Time Anymore” stands out as a straight-up blues with Anna going for a much more raw vocal sound for the first time on the album. Like everything else on the album, it works perfectly. “Anna Laube” is a hugely varied album which is held together by themes of nostalgia and self-exploration and Anna’s controlled and emotive voice. Unlike many Americana albums, it doesn’t reach out to other continents for influences, picking out various strands in recent American musical history for its inspiration, and it feels more cohesive for that restraint. Play this; it will make you feel good. “Anna Laube” is out in the UK on July 31 on Aah…Pockets! Records (Aah…Pockets!01).